Plow & Hearth: No coupon code needed. Tap to shop the sale now. Plow & Hearth: Tap offer to copy the coupon code. Remember to paste code when you check out. Online only. Plow & Hearth: Clearance! Save up to 60% On Great Gifts. Today Only! Turn Up The Heat On Savings! 10% off your order over $25. Plow & Hearth: Get $10 Off Any Purchase When You Join the PlowHearth Email List! Plow & Hearth: Get Up to $200 Off Select Tangier Wicker Collection. Plow & Hearth: Get $50 off or more on Select Items during sale. Plow & Hearth: Annual Winter Sale! Get 20% off Select bestsellers American Country Home Furniture for savings up to $400. 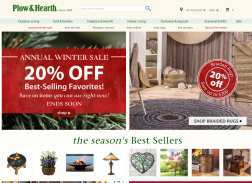 Plow & Hearth: Save 50% or More on Outlet Specialty Sale Collections.